"I am passionate about making liberal religion a vital force in American society," says the Reverend Stephen Landale, who will be installed this month as minister of the Unitarian Universalist Church in Eugene. Raised in Williamsport, PA, the youngest of 10 kids in a Roman Catholic family, Landale was introduced to the UU Church shortly after his 1990 graduation from Cornell, with a degree in Urban Studies. "I was drawn to the focus on Jesus as a human exemplar, rather than as the unique son of God," says Landale, who enrolled in UU's Starr King School for the Ministry in Berkeley. From 2001 through June of '07, he served his first settled ministry at the Bell Street Chapel in Providence, RI. "My church was the first in the state to oppose the US initiating war with Iraq," he notes. "For a couple of years, I was the most visible religious leader supporting equal marriage rights." 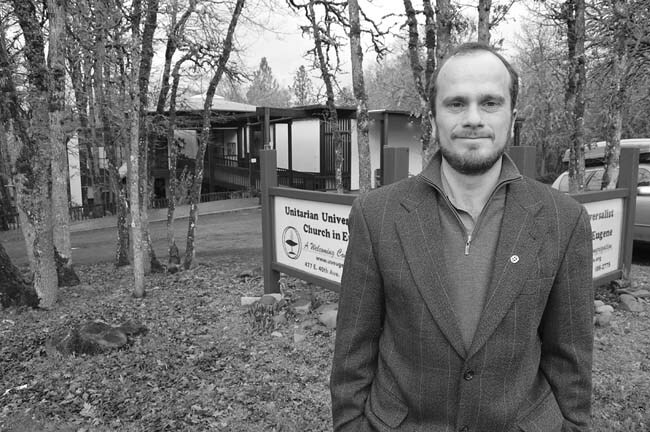 Because of limited space at UU Eugene's East 40th facility, Reverend Landale's installment ceremony will be hosted by the First Christian Chuch, 1166 Oak Street, on Sunday, January 27, at 4 pm. Details at uueugene.org.